A report from the 9th Annual Technologies for Critical Incident Preparedness Conference and Exposition presented by the U.S. Departments of Justice, Homeland Security and Defense in San Francisco, November 2007. SAN FRANCISCO — The police response to the April 16th shootings at Virginia Tech in Blacksburg, Va. was an exemplary demonstration of multi-jurisdictional active shooter training, said Philip Schaenman, Staff Director of the Virginia Tech Shooting Review Panel speaking at the 9th Annual Technologies for Critical Incident Preparedness Conference & Exposition.. The costly mistakes, he said, were made by school officials, who failed to send out an emergency, campus-wide alert that a gunman was on the loose following the first attack. Furthermore, due to restrictive privacy laws, the university lacked a “fusion center” that could have effectively processed the shooter's paper trail of red flags, including reports of suicidal tendencies and disturbing psychological displays, in order to alert parents and police. In his Nov. 7 session, “Lessons Learned at Va. Tech,” Schaenman walked attendees through the events of that morning, as concluded by his team of reviewers. Virginia Tech is situated on a sprawling campus in rural Blacksburg, Virginia. The campus has a population of 35,000, contains 131 buildings and has no security perimeter or fence. Five full-time officers patrolled the campus. At the time of the massacre, university officials were upgrading the campus alert system to include sirens and speakers; however, on the day of the shooting the only alert systems in place were rudimentary phone trees and email. At 7:20 the morning of April 16th, Seung-Hui Cho, a student who had been identified as mentally troubled, walked into West Ambler Johnston Hall dormitory room and shot 19-year-old student Emily Hilscher dead. A resident advisor who responded to disturbance calls (according to the panel report, the gunfire “sounded like someone fell out of bed”) was also fatally shot with rounds from a 9 mm pistol. Cho stepped over the dead students’ bodies, tracking bloody footprints down the hallway and out the door to the outside. Campus police and the executive V.P. 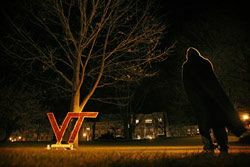 of Virginia Tech were alerted to the situation minutes after the dormitory killings took place. Based on a preliminary interview, officials concluded that the incident was domestic in nature and that the prime suspect had been indentified and was no longer a threat to campus. Whether or not an alert at this juncture would have made a difference in the outcome is a point of controversy (and the basis of multiple lawsuits) within the campus community. Sitting on this information, of course, had a devastating impact later that day. The critical takeaway lesson, Schaenman said, is this: Share the information you have at the time you have it. "For a campus with 500 doors in 131 buildings, the concept of an absolute lockdown did not apply," Schaenman said. "There was simply no way to lock or guard all of the doors. And the shooter, as far as anyone knew at the time, could wait out a lockdown." While campus police were investigating the double homicide in the dorm, the shooter set the his deadly plan in motion by first changing his clothes, then heading to the campus post office to drop a now infamous video manifesto on his mass-murder intentions in the mail. Cho carried chains in his backpack in order to lock campus building doors from the inside, which he did immediately after entering the academic building Norris Hall at 9:15-9:30 a.m.
A few students came into contact with the chains on their way in, and, assuming it was construction, crawled in through a ground floor window. At this point, Schaenman said, if they’d known an alert had gone out, the anomaly of seeing chains on the door might have given them enough pause to move away from the building and alert authorities. Similarly, students who later recalled hearing shots, had initially dismissed it as construction noise. They had been given no reason to think otherwise. The shooter, who stayed completely silent throughout the massacre, began walking down the hall, entering classrooms, and indiscriminately shooting everybody he could at point blank range. Ten students successfully jumped out of windows and onto the grass, but many classrooms led out to concrete, making this escape impossible. Students barricaded themselves against Cho from inside the classrooms. Those who managed to use their hands and feet to barricade the door around the periphery survived. (Cho attempted to shove the door open and shoot around door handle, but soon gave up.) In other classrooms, those who instead braced their bodies against the door were shot dead. Within eleven minutes, 45 people had been shot. The death toll for that day skyrocketed to 30. “A simple rubber doorstop would have helped tremendously,” Schaenman said. The first call for help to go through went to the Blacksburg Police Department at 9:41 a.m.
"The call did not go to campus police due to the location of the cell tower," Schaenman said, adding, "The Blacksburg dispatcher did not recognize 'Norris Hall.'" The call was then transferred to campus police (VTPD). Three minutes later, Blacksburg and Virginia Tech police arrived at Norris Hall. They attempted to gain entry through three different doors, however, failed to shoot the chains off. Eventually police are able to shoot open a key lock to a fourth door, and follow the sound of the shots to the second floor. Schaenman said that the police departments knew each other and were very well coordinated. “They had trained for an active shooter incident,” he said. "Part of this training meant studying the police response that had taken place at Columbine, in which teams of responding SWAT came close to shooting each other." To avoid this potential confusion, he said, one team of police proceeded rapidly to the second floor landing, while a second team headed up the opposite stairwell to the third floor. Both teams started clearing rooms. Triaging the 48 gunshot victims and aiding survivors in multiple classrooms. Coordinating rescue efforts to remove survivors from Norris Hall. Gathering preliminary suspect or gunman descriptions. Determining whether or not there was more than one gunman. At 10:08 a.m. a deceased male believed to be the shooter was found with self-inflicted gunshot wounds to the head. The shootings at Virginia Tech would go down as the worst mass-shooting incident in U.S. history. But Schaenman was clear that the deadly mistakes were not found in the police response, but rather the university's delayed email-only alert response (a total of four email alerts had been sent during the course of the incident). Schaenman praised the Blacksburg PD and VTPD for mobilizing an immediate and coordinated response to the gunman. “That day," Schaenman said, "police proved the importance of training all officers for active shooter incidents." Read the review panel's full report.